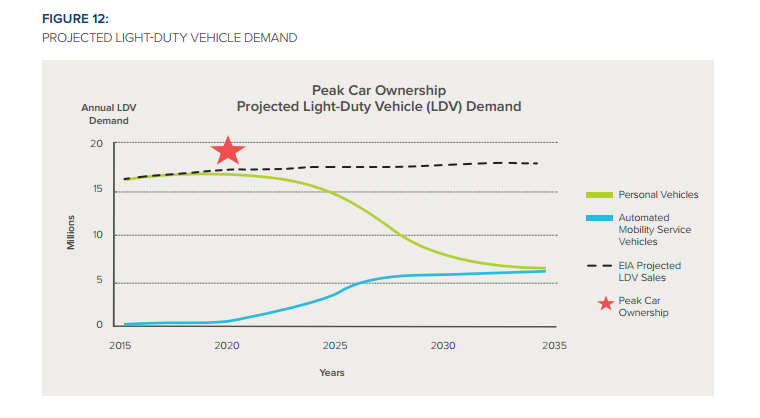 In a new report, the Rocky Mountain Institute makes the stunning prediction that car ownership will peak by 2020. 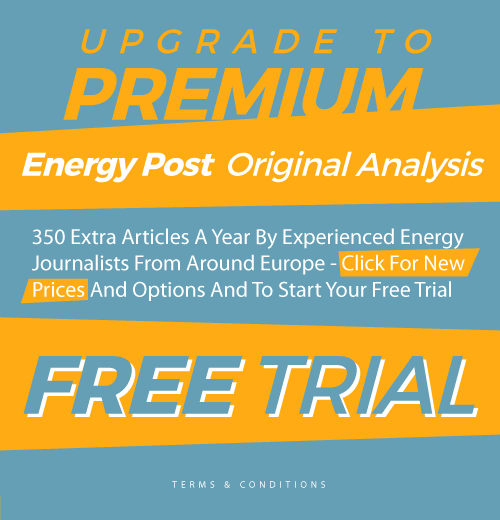 New ownership models and technological advances such as driverless cars will utterly transform the mobility market, concludes Fereidoon Sioshansi, president of Menlo Energy Economics and publisher of the newsletter EEnergy Informer. The big casualty will be oil companies, which are still in denial. Technological innovation and disruption are relentlessly eating into traditional businesses, offering similar or superior service at a fraction of the cost. Uber’s spectacular rise challenging traditional taxi monopolies, of course, is everyone’s first example. Airbnb and countless others are doing the same to other established industries. But Uber’s ultimate goal goes deeper than challenging taxi monopolies. It is about the future of mobility, especially in growing urban centers as described in 1 Oct 2016 issue of The Economist. The subject is Maas Global, a Finnish enterprise offering mobility-as-a-service or MaaS. Forget taxi monopolies; they are already history. These are among the reasons that will increasingly challenge the traditional business models of oil and auto companies. The latest to predict the doom of traditional auto companies is a report by the Rocky Mountain Institute (RMI), which predicts that car ownership will peak by 2020. One can argue about 2020, but the overall trends are probably hard to dispute. The reasons are by now familiar: urban dwellers who now outnumber rural ones, will increasingly rely on public transportation and/or hailing services such as those offered by Uber and its rivals. The rise of autonomous cars will only accelerate these trends, gradually shrinking demand for private cars, indeed car ownership, period. Why own one if you can get a ride from Uber any time you want by hailing a cab, with or without a driver? According to RMI – as always one needs to read the fine print and the assumption – by 2018 the average per passenger mile cost of travel on automated Transportation Network Companies (TNCs) will beat that of a personal internal combustion engine (ICE), in this case Toyota Camry, currently the bestselling car in the US market. Toyota executives take note. The key, according to RMI, is not the rapid rise of TNCs such as today’s Uber business model, but the automation of TNCs, the emergence of driverless or autonomous cars offering shared mobility using Uber-like hailing service. The reason should be self-evident once one examines figure 1. 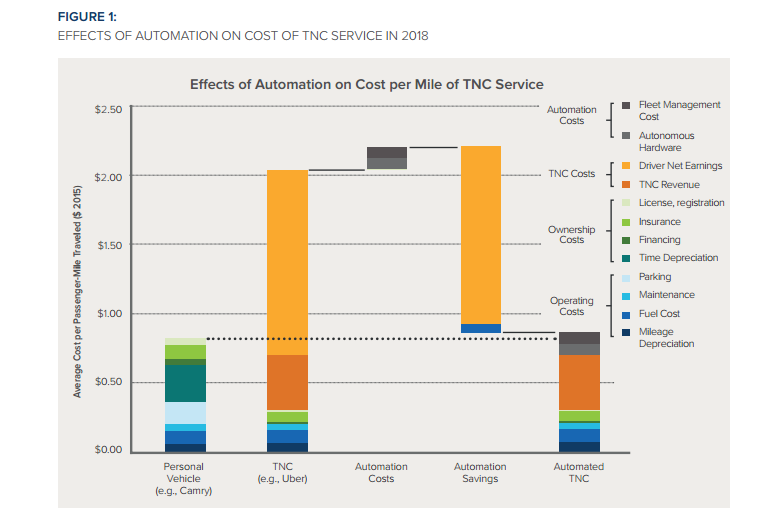 Without the cost of the driver, the automated TNC’s costs beats conventional car ownership. And that is in 2018. Fast forward to 2028 and beyond, and the impact of shared autonomous mobility begins to sink in. The RMI report has even more bad news for the oil majors. 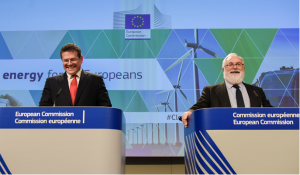 Their nemesis is electric vehicles (EVs), increasingly charged with essentially free renewable electricity due to the equally rapid rise of renewable generation in many markets. 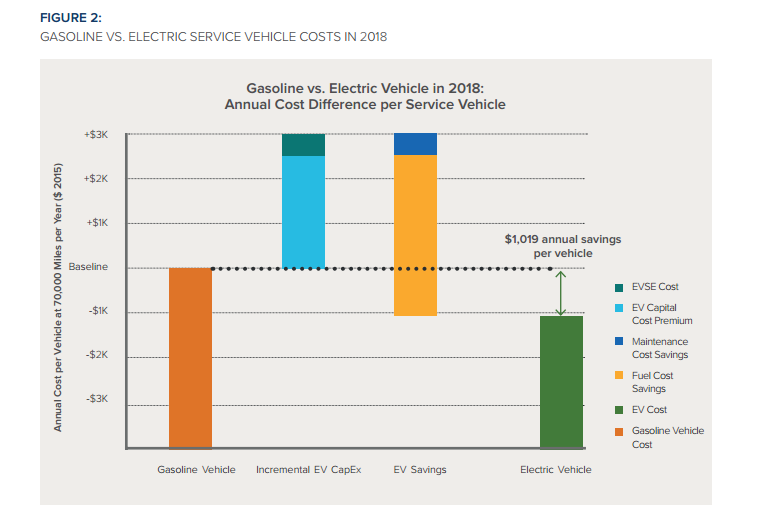 As illustrated in figure 2, by 2018, EVs will offer an estimated $1,000 per annum cost advantage over internal combustion engines (ICEs) powered by gasoline. 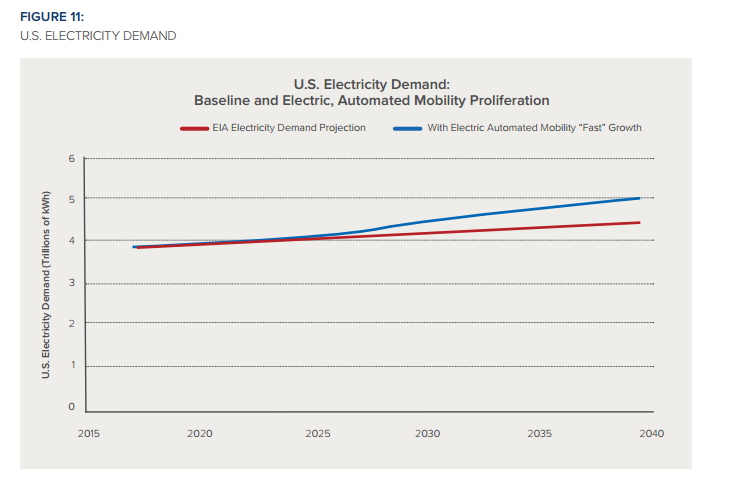 Once again, these predictions are critically dependent on assumptions about the relative cost of operating EVs versus ICE, cost of electricity versus gasoline, range, performance and a host of other issues. With so much investment going into the next generation EVs expected in the market over the next 5-10 years, their costs are expected to decline while their range will be extended and their performance enhanced. That much is for sure. 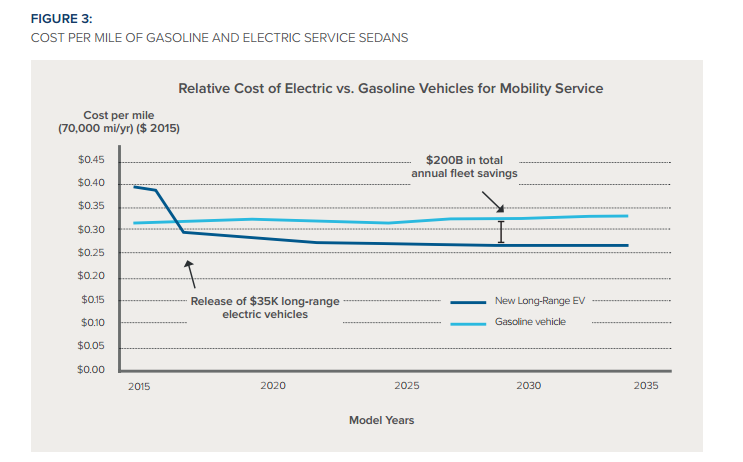 RMI reaches obvious conclusions by comparing the per-mile costs of EVs vs. traditional ICEs. The next generation of EVs – such as Tesla’s next model expected in 2017 and costing $35,000 – are projected to beat gasoline varieties on per-mile basis for someone driving 70,000 miles per annum starting around 2018 – give or take a little (figure 3). 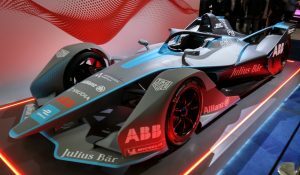 As time goes on, EVs are projected to gain on ICEs. Price of oil matters but probably not enough to change the outcome over time. 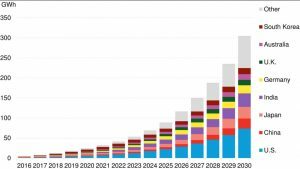 The next few years, of course, will be critical for EVs depending on how fast the technology improves, how the range and performance of batteries increases and how fast the charging infrastructure advances. RMI examined 26 major US markets estimating huge potential, perhaps as much as $123 billion for early adaptors. It predicts rapid penetration rates for what it calls automated mobility services – such as driverless Uber – by 2024 among the same mass markets in the US under 2 scenarios (figure 7). 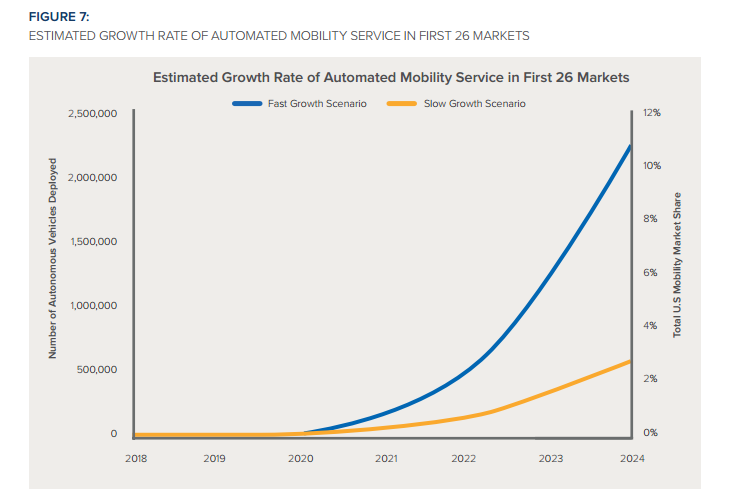 Under a rapid growth scenario automated mobility service or AMS may exceed 10% of total US mobility service market share by 2024. If that is not an amazing prediction, what is? 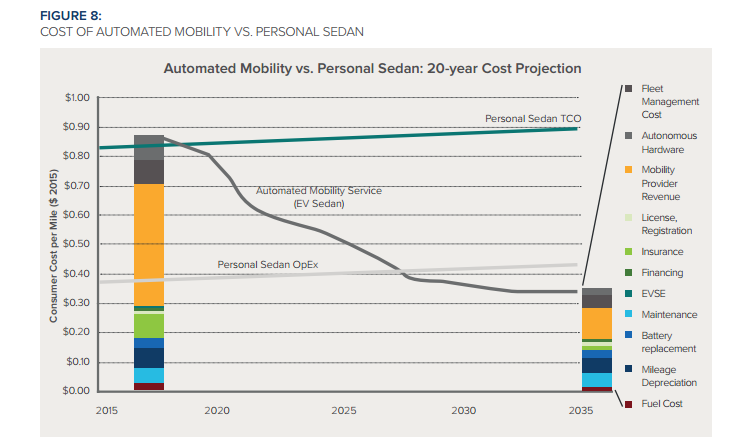 Comparing costs – and making assumptions that may or may not prevail – RMI shows a rather dramatic drop in the cost of automated mobility service, dropping by more than half by 2035 as illustrated in Figure 8. 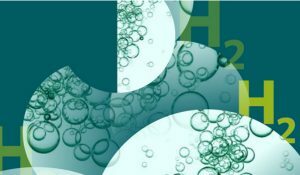 Forecasting anything for 2035 is a heroic undertaking given the rapid pace of technological change, yet RMI’s assumptions about the future may turn out to be an underestimate. Who knows? And how long will it take for EVs, AMS and TNCs to be adopted by the mass market? Clearly, the answer critically depends on the relative merits of the new technology vs. the existing one. It took 18 years for automobiles to reach 40% market share; only 10 years for smart phones. Automated mobility, according to RMI, will reach the 40% around 15 years. It is an educated guess. Many pundits think it will be faster. For those in the power sector who are salivating at the prospects of EVs giving them a boost in sales and revenues, there is good news indeed. 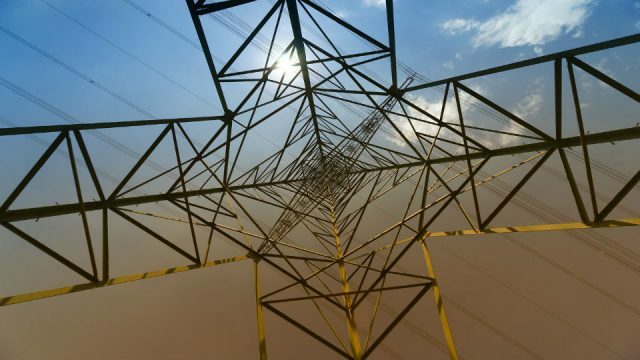 US electricity sale projections by the Energy Information Administration (EIA), which are probably optimistic, show sluggish demand growth to 2040 (Figure 11). Add automated electric mobility and the prospects improve noticeably starting around 2025. Yet, it is not clear how much this will add to the industry’s revenues. 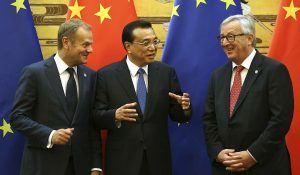 The answer depends on multiples of factors and assumptions about how and when the EVs will be charged, what type of rates and tariff incentives will be on the offer, and – most important – how the increased demand will come be met, from renewable generation resources or conventional thermal plants. If one assumes a Teslaesque model, where EV owners may generate most of the juice from rooftop solar panels installed by SolarCity, perhaps with decentralized storage using Tesla’s Powerwall batteries, then the electricity sales experienced by traditional utilities may not increase much. The RMI report ends with identifying further research needed to better understand the pace of change including the impact of AMS on cities, the impact on the electricity grid, consumer adaptation and behavior and the need for smart policy and regulations – all critical to the evolution of mobility especially in urban areas. Drivers are likely to become unnecessary, potentially destroying the livelihood of millions of drivers around the world – taxi drivers, truck drivers, bus drivers, among others. Auto companies are taking note. Oil companies are, for the most part, still in denial. The traditional business model has been profitable and predictable for decades. Why abandon it now?